With all the great activities and fun things to do in Hawaii, there may be some days where all you feel like doing is spending a lazy day lounging on a sunny beach with warm sand beneath your feet, and the crystal clear waters of the Pacific lapping at the shore in front of you, the beaches of Hawaii are very enticing. Plus, a day at the beach is easy on your wallet since many beaches are open to the public for either free or a minimal cost. If the beach you pick has large waves, and you want to swim, it might be a good idea to try another beach with calmer water, as the currents can actually be dangerous at times. One of the best things about Hawaii is the wide variety of beaches. 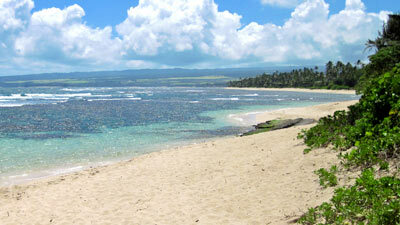 Some are broad and flat with white sand, gentle waves and warm breezes. On the other side of the island, you might find a short, steep beach with big waves breaking, a stiff breeze and rugged cliffs nearby. On Oahu, many beaches are popular with the tourists and are lined with hotels and have lots to offer as far as recreational activities such as parasailing, surfing classes and catamaran rides. Other beaches are quiet, out of the way places lined with nothing but swaying palm trees and black sand. So whatever your taste in beaches, you can be sure you’ll have no trouble finding one to suit your taste in Hawaii.